Cinna&Portia. I decided to give the cast مزید ethnic diversity. 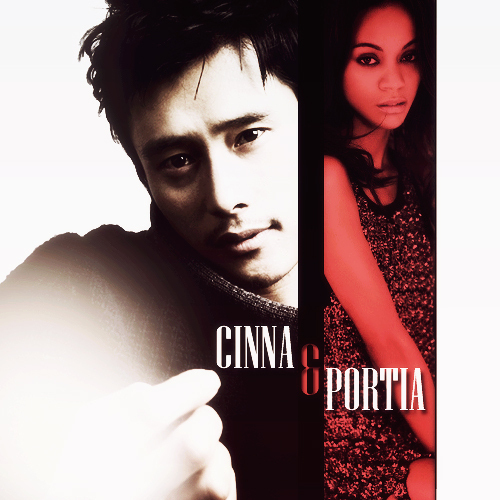 Byung-hun Lee as Cinna, and Zoe Saldana as Portia. I know Portia isn't a big character in the series, but who's to say they won't make somewhat bigger in the movie? Regardless, I want Zoe. x). Wallpaper and background images in the The Hunger Games club. This The Hunger Games fan art might contain پورٹریٹ, آرچر, closeup, تصویر, and ہیڈشوٹ. I think both of those would be great choices for Cinna and Portia! Byung-hun Lee especially looks the part to me, for some reason, though it's never how I pictured Cinna!